A month and a half ago, my friend, D, invited me on a day trip to her current favorite place in the world. It's Great Basin National Park, specifically Lehman Caves! It is in Baker, Nevada and is a very beautiful spot. 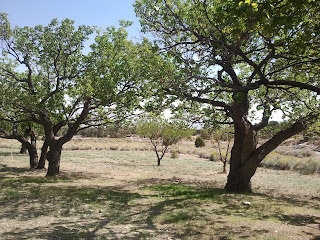 But the draw for her is not the scenery or the Cave Tour, nor even the souvenirs, all of which are lovely On the grounds of the park is a little grove of apricot trees that were planted by Mr. Lehman over 90 years ago. These apricot trees are still producing fruit and are organic and of heirloom variety. 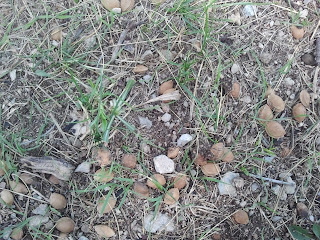 The reason D. was drawn to these trees is not the fruit, but the pits strewn on the ground in abundance. The fruit was left to grow naturally and left unharvested, except for the herds of deer who came to partake of the dropped fruit in the late summer and any tourists who wanted to sample the fruit as they passed through. All the discarded pits were left under the trees. 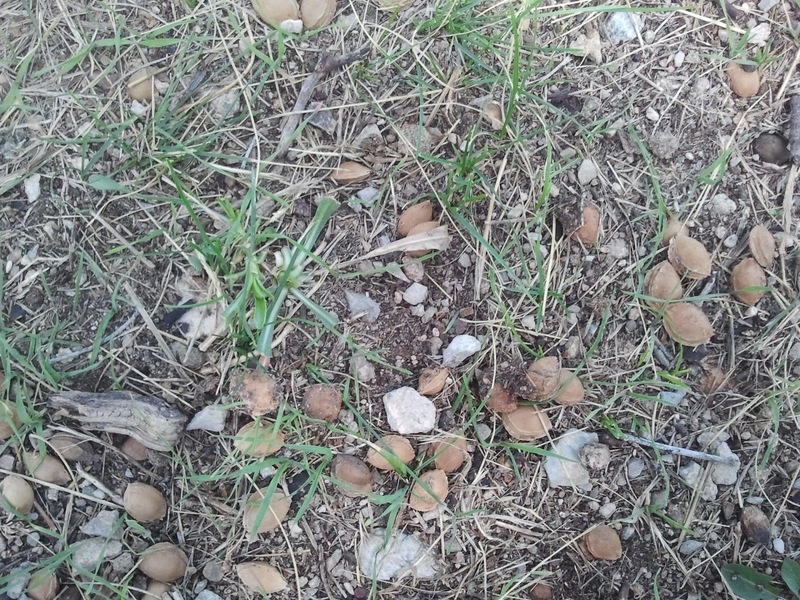 When D. came upon this grove, there were thousands and thousands of apricot pits covering the ground under the trees. When she saw them, she was beside herself with joy. For all these years the pits had been accumulating, meaning nothing to the visitors, park rangers and passers-by. But to her they are like gold and here is why. D's 20-something son has been diagnosed with leukemia and these apricot pits could mean his ultimate cure. They contain a compound called Laetrile, or Vitamin B17, which synthetically is compounded into cyanide. Now, I know that you're thinking, hello, cyanide is a poisonous substance! But that is the synthetic form. In its natural form, Laetrile attacks rogue cells in the body, especially cancer cells. If the FDA had let the cat out of the bag years ago, millions of people would still be alive, in my opinion. About 15 years ago, I started hearing murmurings of people taking trips out of this country to go get treated in places like South America and Mexico because of these natural cures, illegal in the U.S., that were healing them from all kinds of cancers. I also heard about the benefits of apricot seeds and their healing effect. But then I heard that they had cyanide in them and that they were poison. I didn't think anything else about it and eventually quit hearing about it at all. Until now: D. is determined to help her son. A healthcare professional and a longtime believer that natural foods and processes are best, she started educating herself through books, doctors, knowledgeable individuals and her own instincts. I think she is definitely onto something, especially after reading 'World Without Cancer' by G. Edward Griffin. The first edition, published in 1974 and the second updated edition, published in 1997, is still a shocking revelation about how conspiring men took over our medical system and the government regulatory agencies to produce products that lined their own pockets with millions of dollars, making them the richest men in the world, but sacrificing the lives of millions of poor, unknowing individuals. They intentionally tampered with experiments and studies of Laetrile, a natural and inexpensive substance, and skewed the results. And to make it even more inaccessible, Laetrile was made illegal and a campaign was waged to make it known as quackery and even harmful. But here in Baker, NV was a virtual gold mine, in terms of hope and healing and so D. gathered up almost every last pit. She must have visited the park several times. I was fortunate enough to go with her once. The park rangers were somewhat curious at first, but when she told them about her son and that apricot seeds could be beneficial for his leukemia, they let her be. I went with her on one of her trips and got to help her. My reward? A box full of at least 1000 apricot pits. They are totally harmless, if taken in the correct amount. The recommended dosage is 5 per day. They can be bitter-tasting and so you can mix them up with molasses and take them that way or you can eat them straight like I do and chase them down with a favorite drink! I don't think they taste bad at all, especially coming from these wonderful, non-pesticide, heirloom trees! My hope is that D's son will be cured of his leukemia and that she will be able to help others with her knowledge and resources. She wants to use some of these pure apricot pits to sprout apricot seedlings so that others who want that kind of resource can have them. But what I think we still need is more enlightenment and education on the subject of Cancer and it's cures. I still have a lot to learn on the subject, but I do want to know if Laetrile or Vitamin B17 is being utilized now, after being discovered as being an anti-cancer substance as early as the mid-1920's! Right now Laetrile in any form other than what you may get naturally, from your own garden, is illegal in the US. Why is that? Now, cancer has overtaken heart disease as the No. 1 killer among Hispanics in the U.S., and the rest of the country may be only a few years behind. And yet, cancer treatment is one of the most profitable businesses in the nation. I'd like to see such a huge profit margin have a better success rate than what has been happening in this country. Can you tell that I loved my little road trip of apricot pit harvesting? I definitely did! So true, D! You and so many other healthcare professionals are so caring and gifted and we couldn't ask for better. 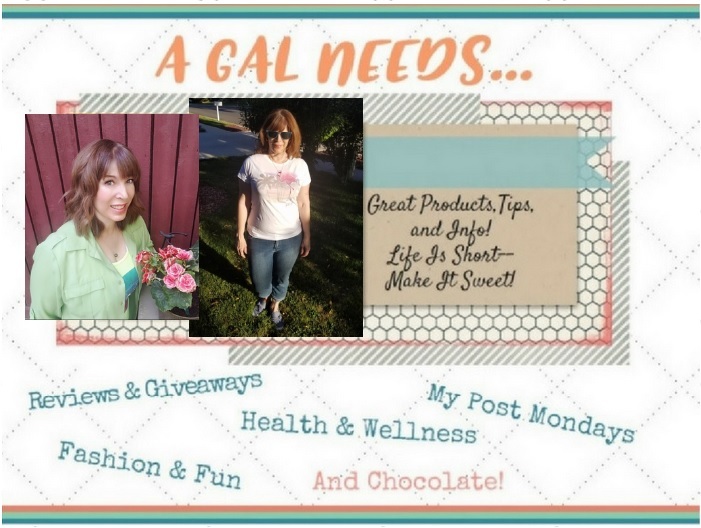 Now, please, let's give you more to work with and use those gifts for even greater good! Beautifully spoken, and I am so thrilled that you are now cancer-free! Luv you! Thanks dear Helena! Love you too! Talk to Betty Barrett!! This is how they cured her of her cancer years ago! I knew that she had gone the natural route, didn't know with what, though.